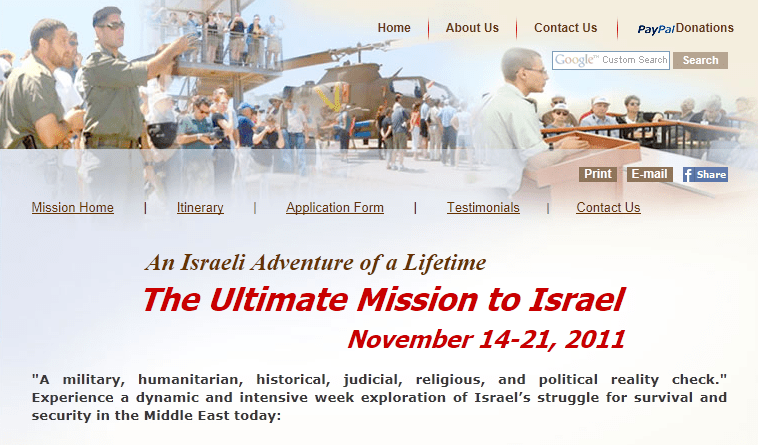 I first learned of an intriguing excursion known as “The Ultimate Mission to Israel” in 2009 while perusing an article on the website of the Jerusalem Post. The article, which outlined Israel’s sudden concern for the fate of UNIFIL despite its repeated targeting of UN personnel and institutions in Lebanon, cited Israeli Defense Minister Ehud Barak as warning that—in the event of a significant gain by Hezbollah in the upcoming Lebanese elections—Israel would no longer “feel the restraints it did in 2006 about attacking Lebanese infrastructure”. Barak refrained from explaining how the 2006 destruction of much of Lebanon, including apartment complexes, milk factories, bridges, children in the backs of pickup trucks, and approximately 1200 other people qualified as infrastructural restraint. I was distracted from pondering the issue myself by a large advertisement featuring soaring warplanes in the bottom right-hand corner of my computer screen. an inside tour of the IAF targeted killings unit. attendance at a military trial of “Hamas terrorists”. a “live exhibition of penetration raids in Arab territory”. For anyone not entirely convinced that things like “penetration raids” should perhaps be orchestrated in response to concrete events rather than arbitrarily scheduled months in advance, rest assured that more of these will take place during the next installment of The Ultimate Mission, this coming Nov. 14-21. Ultimate missionaries will be lodged in five-star accommodations in Jerusalem. The fee for the mission, excluding airfare, is $2,895 a person, plus a mandatory donation of between $500 and $5,000. In the event that those preoccupied with Israel’s “struggle for survival” want to develop new ways to throw capital at gross displays of militarism, meanwhile, there is always the option of converting the next Operation Cast Lead into an experiment in military tourism, and extracting fees from foreign civilians who want to witness firsthand the existential threat posed to white phosphorus munitions by the skin of Palestinians.